The glaucophytes are a small group of freshwater microscopic algae. Together with the red algae (Rhodophyta) and green algae plus land plants (Viridiplantae or Chloroplastida), they form the Archaeplastida. The glaucophytes are of interest because they may be similar to the original algal type that led to green plants and red algae. The relationships between these groups are not yet clear, and the glaucophytes in particular need more study. The chloroplasts of glaucophytes are known as 'cyanelles'. Unlike the chloroplasts in other organisms, they have a peptidoglycan layer, like bacterial cell walls. This is thought to be a relic of the endosymbiotic origin of plastids from cyanobacteria. 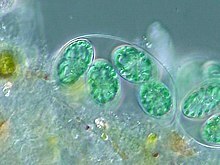 Glaucophytes have the photosynthetic pigment chlorophyll a. They harvest light with the same type of pigment molecules as do cyanobacteria and red algae. Green algae and land plants have lost that pigment, which is known as phycobiliprotein. Glaucophyte mitochondria and flagella (if present) are similar to forms found in some green algae. Only 13 species of glaucophytes are known, none of which is particularly common in nature. There are three genera. The glaucophytes were previously placed in the order Chlorococcales. ↑ 1.0 1.1 1.2 1.3 1.4 1.5 Patrick J. Keeling (2004). "Diversity and evolutionary history of plastids and their hosts". American Journal of Botany 91 (10): 1481–1493. doi:10.3732/ajb.91.10.1481. PMID 21652304. http://www.amjbot.org/cgi/content/full/91/10/1481. ↑ Kim, Eunsoo & Graham, Linda E. (2008). "EEF2 analysis challenges the monophyly of Archaeplastida and Chromalveolata" (Free full text). PLoS ONE 3 (7): e2621. doi:10.1371/journal.pone.0002621. PMC 2440802. PMID 18612431. http://www.plosone.org/article/info:doi/10.1371/journal.pone.0002621. ↑ Palme J.D; Soltis D.E. & Chase M.W. (2004). "The plant tree of life: an overview and some points of view". American Journal of Botany 91 (10): 1437–1445. doi:10.3732/ajb.91.10.1437. PMID 21652302. http://www.amjbot.org/cgi/content/full/91/10/1437. ↑ 4.0 4.1 Skuja A. 1948. Taxonomie des Phytoplanktons einiger Seen in Uppland, Schweden. Symbolae Botanicae Upsalienses 9 (3): 1-399. This page was last changed on 16 October 2018, at 17:15.